Abiotic stress has a detrimental impact on the living organisms in a specific environment and constitutes a major constraint to global agricultural production. The adverse environmental conditions that plants encounter during their life cycle not only disturb their metabolic reactions, but also hamper their growth and development on cellular and whole plant levels. These conditions are of great concern, particularly for those countries whose economies primarily rely on agriculture. Under abiotic stresses, plants amalgamate multiple external stress cues to bring about a coordinated response and establish mechanisms to mitigate such stresses by triggering a cascade of events leading to enhanced tolerance. 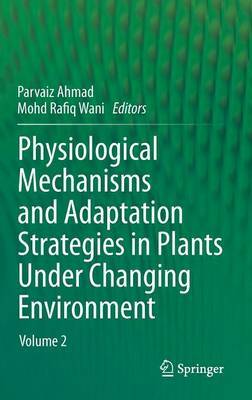 Physiological Mechanisms and Adaptation Strategies in Plants under Changing Environment, Volume 2 displays the ways by which plants utilize and integrate many common signals and subsequent pathways to cope with less favourable environmental conditions. The book also describes the use of contemporary tools for the improvement of plants under such stressed environments. Concise yet comprehensive, Physiological Mechanisms and Adaptation Strategies in Plants under Changing Environment, Volume 2 is an indispensable resource for researchers, students, environmentalists and many others in this burgeoning area of research.